Gavin Hoyte's early goal was enough to give Barnet a hard-fought win. 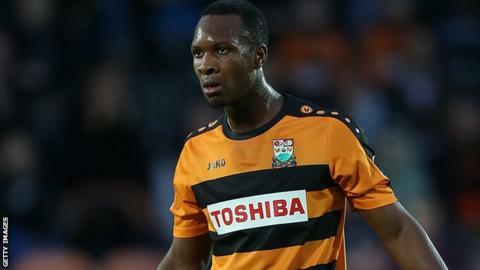 Barnet recorded their first win of the new year despite being reduced to 10 men against high-flying Bristol Rovers. Defender Gavin Hoyte opened the scoring for the Bees from 12 yards, coolly finding the bottom left corner from Sam Togwell's pass. But they lost Andy Yiadom after the break when he was shown a straight red card for a foul on Stuart Sinclair. Rovers' substitute Liam Lawrence rifled a shot wide in added time as Barnet held on for a hard-fought victory. "It was a good win, the players played extremely well. It was very, very difficult with the wind and the rain. "The players put in a tremendous performance after such a lacklustre, disappointing performance last week. "It's a good day and it was nice to end the game with the supporters happy. I think they could tell how difficult it was for the team to defend against the wind." Match ends, Barnet 1, Bristol Rovers 0. Second Half ends, Barnet 1, Bristol Rovers 0. Attempt missed. Liam Lawrence (Bristol Rovers) right footed shot from outside the box is close, but misses to the right. Attempt missed. Liam Lawrence (Bristol Rovers) right footed shot from outside the box misses to the right. Matt Stevens (Barnet) wins a free kick in the defensive half. Attempt missed. Ellis Harrison (Bristol Rovers) header from the centre of the box is close, but misses to the left. Attempt saved. Jermaine Easter (Bristol Rovers) right footed shot from outside the box is saved in the bottom left corner. Luke Gambin (Barnet) wins a free kick on the right wing. Attempt missed. Stuart Sinclair (Bristol Rovers) right footed shot from outside the box is just a bit too high. Matt Stevens (Barnet) wins a free kick in the attacking half. Substitution, Barnet. Matt Stevens replaces John Akinde. Attempt missed. Lee Brown (Bristol Rovers) left footed shot from the left side of the box is too high. Attempt missed. Chris Lines (Bristol Rovers) right footed shot from outside the box misses to the right. Attempt missed. Liam Lawrence (Bristol Rovers) left footed shot from outside the box is too high. Liam Lawrence (Bristol Rovers) wins a free kick on the left wing. Gavin Hoyte (Barnet) wins a free kick on the left wing. Chris Lines (Bristol Rovers) wins a free kick in the defensive half. Substitution, Barnet. Tom Champion replaces Aaron McLean. Substitution, Bristol Rovers. Liam Lawrence replaces Lee Mansell. Substitution, Bristol Rovers. Jermaine Easter replaces James Clarke. Tom Lockyer (Bristol Rovers) is shown the yellow card. Andy Yiadom (Barnet) is shown the red card for violent conduct.